I wanted to dedicate some space to share links to some of the great artists and businesses that inspire me and that I've been able to do business with. 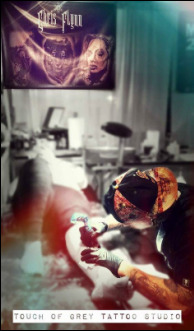 Located in Gardiner, Maine, Chris Flynn and his talented crew offer high quality skin art. This wonderful Portland, Maine based non-profit donates instruments to kids! Our friend Amanda is an angel. ﻿The legendary Brian Froud, a great influence on my imagination as a child, and a colleague of my hero, the late, great Jim Henson.